Get away from it all by unplugging - turn off your electronics and be all in for the person you're with. Add on a romantic floral package from with fun extras - like rose petals on the bed and champagne for two from the Disney Florist. 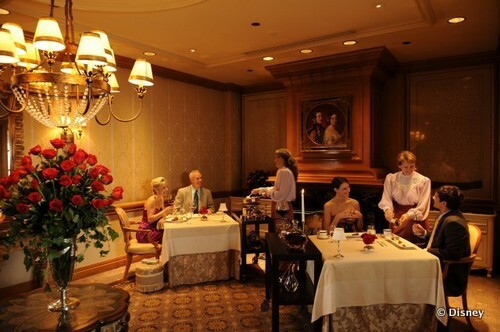 Plan a special meal at one of the fine dining signature restaurants. My favorite at the Yachtsman Steakhouse and California Grill. Request the honeymoon suite at your resort - just because. The turret rooms at the Grand Floridian Resort and Spa are quite stunning. Order breakfast from room service - and don't leave the room until way past noon. Sleep in, watch a little TV, take your time to connect before heading out to the theme park. Make a stack of special vacation coupons - because standing in line for Dole whip while she shops is pretty awesome. Go window shopping for souvenirs, then circle back and buy something your better half admired without them knowing. Give it to them on the trip home. Plan an entire surprise trip! Take a bubble bath - DVC one bedroom and larger villas have giant jacuzzi tubs. You could even use a couple of "Bubble Bombs" from one of the Basin soap stores on property. Write a love letter to your partner saying what a wonderful time you're having and send it home. Take a stroll hand-in-hand along the waterfront - The lights reflecting off of Crescent Lake are especially pretty. Schedule a couples massage at one of the Disney Senses Spas, or have it done in room. Book a carriage ride at Port Orleans or Fort Wilderness. Book a Private Fireworks Cruise. Make sure your companion has their picture taken with their favorite character. Use PhotoPass to get pictures of you together. Hold hands in queue, at dinner, on the boat ride, or just about anywhere! Watch the fireworks snuggled in a hammock on the Polynesian Beach. Book a bounce-back offer for your next couples getaway! There's nothing I find quite as nice as spending some alone time with my husband at the vacation kingdom of the world and adding a little romance to the trip always makes for wonderful memories. 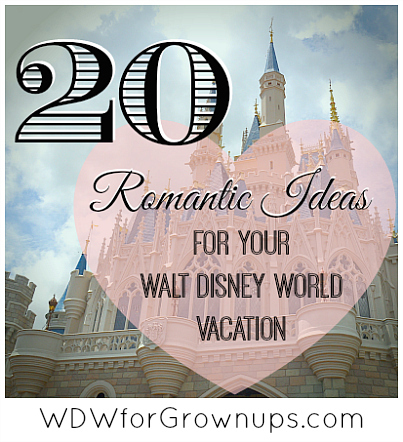 How do you add romance to your Walt Disney World vacation? Which are your favorites from my list? Leave a comment below (keep it G rated) and we'll add the best ones on to this list for future reference! My biggest one: slow down and take it easy. You won't feel romantic running from ride to ride. Instead, relax and enjoy some of the opportunities to pause in some of the lounges, whether in the resorts or in the parks. There's something to be said for sitting back with some nice beverages at a place like the new Brown Derby Lounge or La Cava del Tequila and just take a moment to be together while everything else goes on around you. Make being together an end goal of the trip, not just hitting the most or best rides. Years ago, my husband and I spent some time one afternoon at a certain shady spot in Epcot. We were just enjoying some calming quiet a few steps away from crowds. Years later we privately exchanged fresh wedding vows on the same spot. Now, whenever we are strolling Epcot, we take a minute or two to acknowledge our commitment. The private exchanges in such a public place, a place we love & visit as often as possible, are part of our romance! Take a few minutes of quiet time ( example:just sitting on one of the park benches) to be thankful for the vist to Walt Disney World. There are still a lot of people that can NOT afford to take a trip there- and they are missing out on the awesome fun! I will always be greatful for each time I have been to Walt Disney World!! Our favorite time at Disneyworld is the Flower & Garden Festival, so we've been returning every April since 2007. Two years ago at twilight, we were gazing at the floating topiaries in the lagoon behind the Kim Possible kiosk when my beloved turned to me and asked me to marry him! I said yes and after 29 years together, we were married on top of our favorite ski resort in Colorado two months later. We'll be back to celebrate our engagement again with more Disney magic in just 3.5 weeks! My Wife and I have not been to WDW since I proposed to her in the Rose Garden at MK in 2006. We're booked to go back in December to take part in the Christmas festivities. My husband and I are celebrating our 25th Anniversary at Boardwalk in April. Can't wait! Love this article. My hubby and I just went together without the kids for our 10th anniversary last March and would love to do it again this year. Reading this just brought back all the excitement of the trip. Thanks for sharing! Port Orleans or Fort Wilderness, a lovely breakfast at the Grand Floridian Cafe followed by a couples massage at Senses Spa are just some of the great grown up activities; And strolling along The Boardwalk in the evening was on of our favorite, most romantic activities! There really is a LOT for grown ups (without kids) at WDW!